Rich, Do you actually take into account volume when placing your trades ie. employ VSA principles? Classic SS day on Ftse and Dax, had placed a sell order around 5051 on Ftse, had I left the desk I would still be in the market with over 50pts, however as usual kept moving the protective buy stop closer and ended up with only 23pts-difficult to control emotions:))) not wanting to give up gains. Rich have you managed to overcome this scenario in your trading?? "When a stock makes a high FIRST on a Selling Day then reacts and is selling nearer the low of the day at the close, the indications are for a lower opening on the Short Sale Day. Should the lower opening occur, after the decline the stock or future will make an attempt to rally, in most cases, and this rally will penetrate the—High of Selling Day—if the immediate trend is higher, however, should the rally fail to reach this Objective and at the top of this rally the activity dies out and the trading narrows down to a few transactions at about the same price, then begins to ‘sell off’, we would ‘put out’ a short sale on this declining trend and J-U-S-T as it starts. Hi Rigel. I enjoy your Taylor "summaries" for the day, selecting the parts of the theory that apply to the current day. Please keep it up. This may sound risky to you or at least different: I strive to operate in the most likely Taylor pattern for the day, and somewhere near "the level", I take a stab. My protective stop is in the magnitude of the average daily range (I control my risk by using a very small position) and I try to capture a good portion of the day's range or even more. This obviously has "bigger" risk than operating within the noise, and attempting to tighten trailing stops, micro-managing the trade, etc. but only rarely I get nailed, even though my "levels" are not even accurate, etc. Sometimes if I get lucky and next day is favorable I leave it overnight, etc. I'm talking about playing for the swings instead of playing for the tics. Obviously not with a 6 tic trailing stop loss, if you get my meaning. Just a different way to see all this. Do whatever is best(more comfortable to you. Yes some folks like to engage in swing trading which is what happens if I have some errand and am not at the desk. The average daily range on FTSE and Dax is over 100pts, that kind of stop would be too much of a risk for my trading style but if somebody is trading from larger time frame 30min/60min, that would be the way to go. Classic Buy Violation long around 10.30a.m (GMT), ideal price action as per wyckoff. I will not say that I put to much faith in VSA but if happens to confirm the trade so be it. We all have different ways of trading. I have a daily goal that i aim for. and it is a very consavative number, so this way I dont need to worry about catching the BIG MOVE. As most of the time my targets are reached very fast unless I move the target as the trade progress. it is only a question of how much you need to live with. I find that 500-1000$ a day is more than ample for me. Therefore 1 to 2 trades a day is plenty. just need the patience to pick the right one. Rich, your statistical observation on positive 3DRally is really of considerable value in Taylor methodology. Yesterday on ESmini at least on my spreadsheet, it ended up positive by 1 point- most of the day thought today is going to be a negative value. 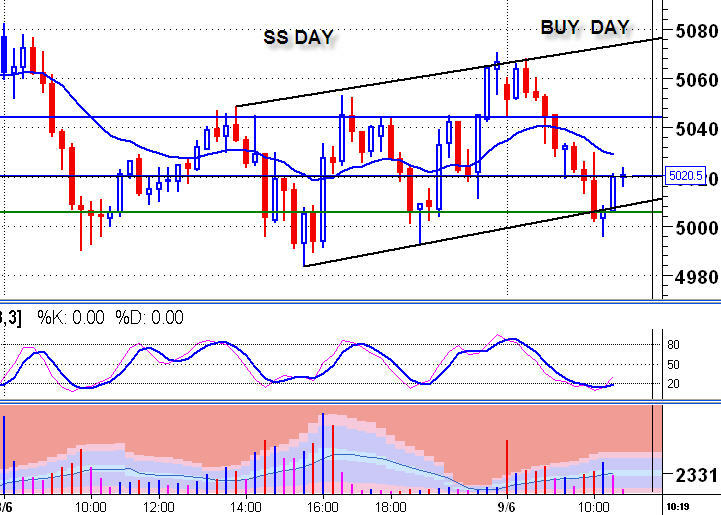 Today Buy day, once again as per comments for the 4th June classic short on the open. This is useless except to illustrate my previous post: Stab at 46 yesterday exit at 61. Risk was about same. Timing and indicators not even looked at. Just saw a higher low/congestion in the afternoon, preceded by higher high at midday. In money terms it's the same to make 20 points on 1 contract or 2 points on 10 contracts. If you are going to scalp 2-3 points, then really your profits are more dependent on your short term tactics than in any Taylor or longer term analysis. Just my view and opinion from the school of hard knocks. I greatly admire those that can actually profit with scalping methods. I can't do it. I mentioned last night that we had ES and YM barely made a Positive 3 day rally and TF and NQ didnt. Having closed on the high for the day and with this confusing signal, I was anticipating getting a rally to get TF and NQ to their previous BDL. From ther it is a bit confusing, do we continue the rally or get the BD decline. And I admire people that can stomach a 15-20 point risk. To each is own. For me 750-1000$ risk on 1 trade is too much. But if you are successfull 80-90% of the time then great. Much less Rich. About 61% win rate only.